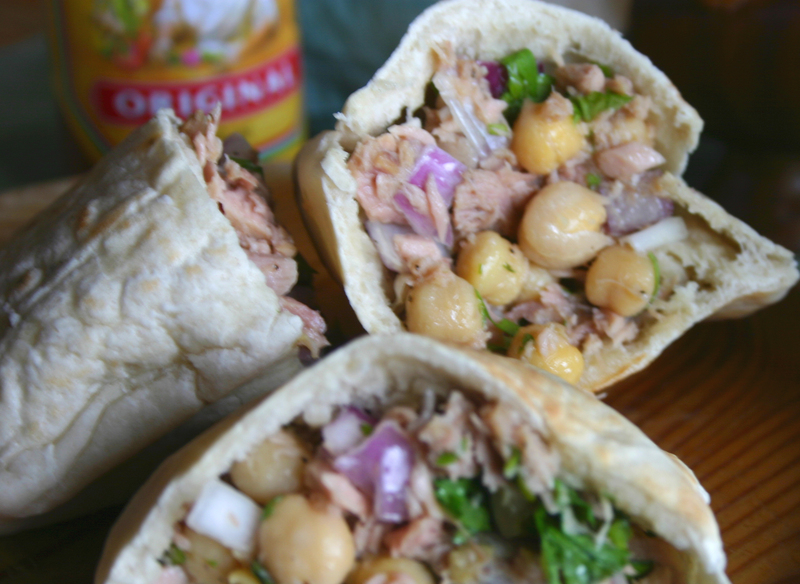 This simple tuna chickpea pitta sandwich is one of my lunchtime staples. I find the mix of textures particularly satisfying. It’s also low in fat and high in protein – the kind of food I’m looking for after recent indulgences. That said, I always choose tuna packed in oil (it tastes so much better) and drain it well. Put the chickpeas, tuna, coriander, cucumber and onion in a bowl. Add the lemon juice and olive oil and mix well. Season to taste. Heat the pitta breads in a toaster or under the grill, cut in half and stuff with the chickpea tuna mixture. Serve with hot sauce, if desired.